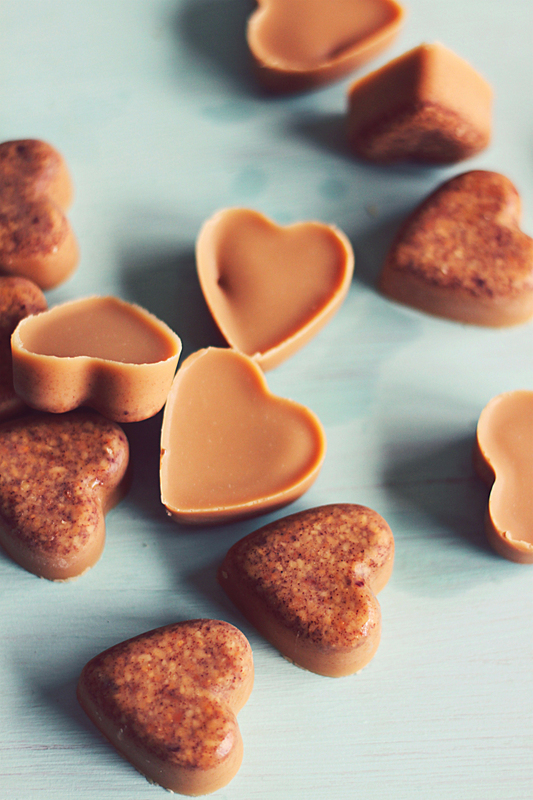 These dog treats are super easy to make and only have three ingredients in them. Those ingredients are not only tasty but they’re also healthful for your pet. 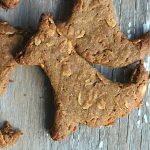 Your furry friend is sure to gobble these dog treats up! We have a new addition to our family, as of last Tuesday. Her name is Penny. When we got our two year old cockapoo, her fur was long and matted. A couple days later, she got cleaned up with a fresh cut. I think she lost 10 lbs in the process! I definitely want these benefits for our Penny so I made these yummy treats for her that includes Golden Barrel Coconut Oil, peanut butter and cinnamon. Why cinnamon? Because cinnamon has anti-inflammatory properties as well as the ability to slow or stop bacterial growth. It helps regulate blood sugar and assists with insulin resistance. Plus it’s just tasty! 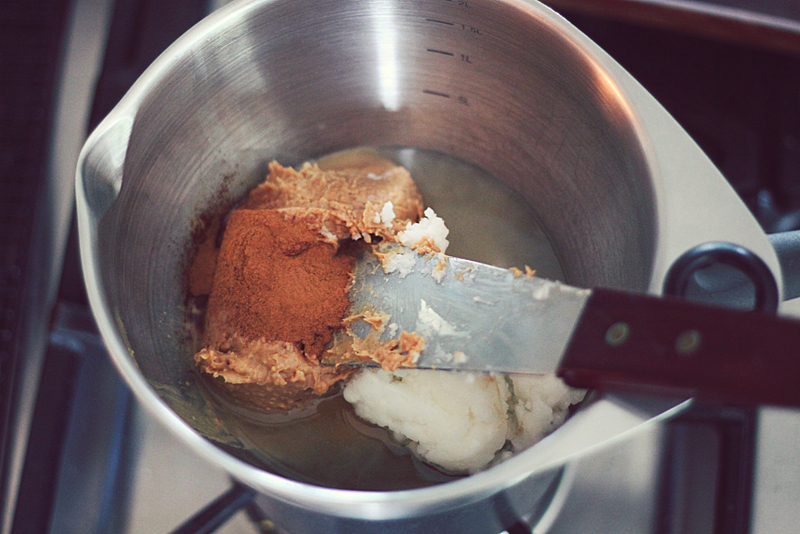 You simply melt the coconut oil and peanut butter in a double boiler on the stove, add the cinnamon, mixing everything together until combined and smooth. Pour the mix into silicone trays and freeze until set. Seriously, this recipe couldn’t be easier! Pop them out of the trays and store in a covered dish in the refrigerator. 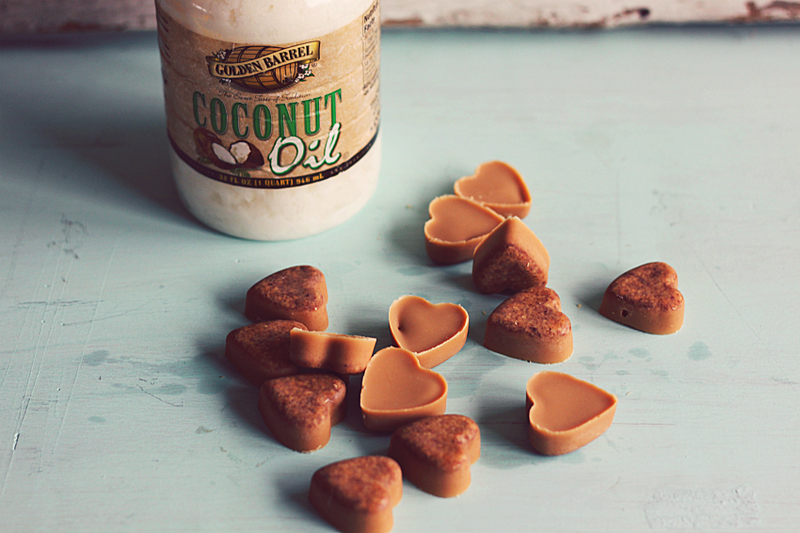 So do you have a furry friend who would enjoy these coconut oil dog treats? It’ll take you all of 10 minutes to whip up a batch. Try it today! Add all ingredients to a bowl (double boiler) over pot on stove. Stir until melted and combined. Using a tablespoon, pour mixture into silicone baking trays and place in freezer until set. 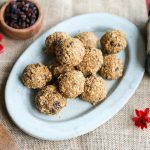 Also try our other recipe: Dog Treats made with Coconut Oil and Blackstrap Molasses. Kat is a mother of three boys who loves to bake and enjoys all things DIY. She has been blogging since 2010 featuring recipes and home design projects. Some of her home projects have been featured in Country Living and This Old House magazine, as well as many other prominent DIY blogs and websites. This treat should be good for humans also, rightL? Sure thing! You could add some honey to sweeten it up a bit. Any thoughts on what to use instead of silicone trays? You could try them in mini muffin pans. Might be a little difficult to “pop them out” but I’m sure if you slide a thin knife blade around the perimeter, they should come out. Hope that helps! I found silicone ice cube trays and those worked well. Bed bath and beyond had them. I used regular ice cube trays and only filled 3/4. Froze. Twisted like you do ice cube. Worked great. How long will they last in the fridge? Hi Judy. 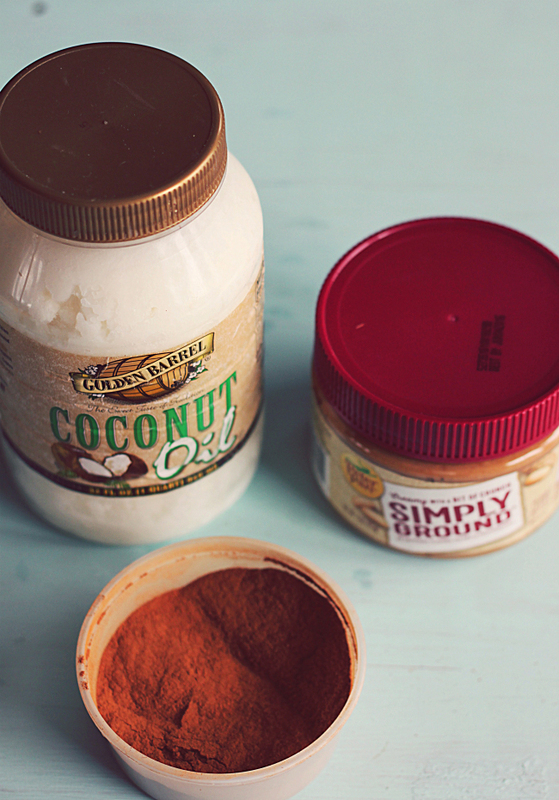 It’s simply 1 cup of peanut butter, 1 cup of coconut oil, and 1 tsp of cinnamon. Easy peasy! I thought cinnamon was toxic for dogs? Not true. Quite beneficial actually. Actually regular cinnamon that you buy in the store is bad for them. Only use ceylon cinnamon. Cinnamon is non-toxic to dogs, cats, and horses, according to the ASPCA. “Cinnamon isn’t toxic for dogs, but nutmeg can be if consumed in large amounts,” says Dr. Ashley Hughes, DVM, at Friendship Hospital for Animals in Washington, DC. In excessive amounts, nutmeg causes hallucinations and high heart rate in dogs. My mother has two toy breads “dots” are a perfect treat. She lets the mixture cool a bit so it starts to thicken. Using a cookie sheet and wax paper she makes “dots” with a teaspoon measure. It works great. nice! sprayed coconut baking spray in plastic ice cube tray…poured in froza,1ish hr. cut apart ..ez. all my pups,loved em thx! I just made these can’t wait to see what my two dogs think of them. So excited to try this! What could I use in stead of the cinnamon? Just omit the cinnamon altogether if it’s something you don’t have/want to add to it. It’ll turn out the same way. Hope you try making them! I give my dog several a day. Thanks for your interest in our recipe. In response to your questions, neither our company or Kat, the blogger and recipe developer, are experts in dog nutrition. We really cannot say how this recipe or adding other ingredients would affect your dogs blood pressure. I would recommend asking a veterinarian or other pet nutritionist. It is possible that the recipe itself would work by adding some honey or other sweetener but that may be something you would have to experiment with. Hope that helps. I am not sure about Dogs, so you may want to call your moms vet, but in humans cinnamon is used to control blood sugar, my husband is diabetic & he takes 2 capsules a day. I’m going to try to make these now! Coconut is a natural laxative for humans. Is it the same for amimals? If it is, several a day makes me worry that he may have an accident in the house. I didn’t have any trouble with my cockapoo, but that’s not to say it works the same with all dogs. 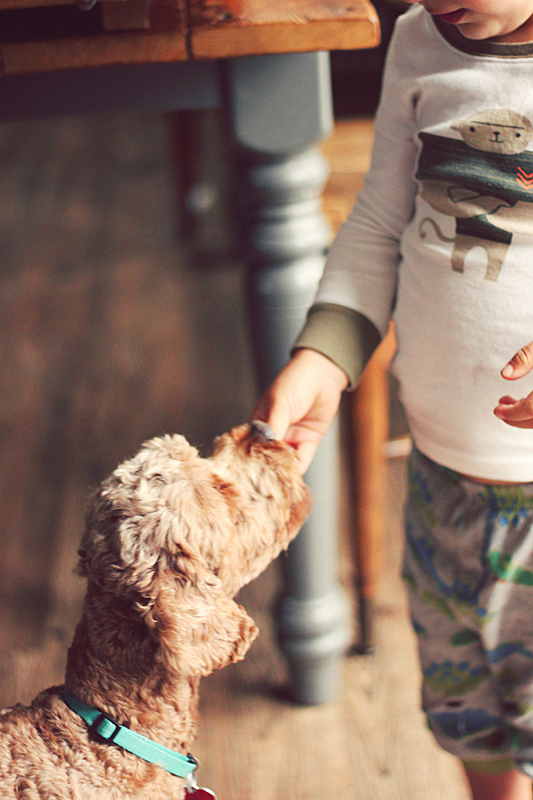 If your dog has a sensitive stomach, start slowly, perhaps with a half size. Work your way up! It’s a tasty treat that’s very beneficial for your furry friend! My dog first started getting the runs on a tablespoon of coconut oil. He’s a 6.7kg Pom. I brought the amount down to and that sorted things for him. It could be a bit of trial and error. As long as it doesn’t last for days and he gets plenty of water, a day or two of the runs won’t do them much harm. I wasn’t sure when I first saw the recipe, gave it a try, so easy to make and my dogs love them. A real smart way to give them coconut oil! As we know, it’s so good for them, (and the dogs owners). Thank you so much for putting this out there! You’re welcome, Bobbie! Glad your dogs love them. And yes, I sneak in a treat myself sometimes…tasty AND healthful! I’m going to make those for my baby girl-she loves her peanut butter! Yay! Hope she likes them! I saw the same recipe with a different source that recommended starting slowly with coconut oil to allow dogs to become accustomed to it. Wondered how you (or others) felt about this and if too much for a small dog could cause problems. This article recommended adapting the recipe to the size of the dog: 1 teaspoon coconut oil per 10 lb. of body weight or 1 tablespoon for 30 lbs., etc. It also said to start with 1/4 dose of coconut oil and increase to full dose over a few weeks. Would you think this means to start with 1 T. for the whole batch (1 c. peanut butter) for a 30 pound dog? Has anyone had problems in giving the 1 c. PB/1c. coconut oil formula to a small dog? Penny (my cockapoo) is a small dog and she does fine with these treats. Maybe if your dog has a delicate stomach, start slowly, but if he/she is healthy, there shouldn’t be a problem giving it a few treats a day. If you’re concerned, just start with one treat. Hope that helps! Will the coconut oil lose it beneficial properties if you microwave everything together instead of using double boiler? If you ever need a double boiler all you need to do is grab 2 pots one a little bigger the other (just needs to fit inside down to the handle and not tip over) put a few inches of water it the bottom one and your good to go. I do this to melt chocolate for all my Christmas candies. Kat, Do you have a great recipe like this for cats? They really need the coconut oil but they are finicky, duh, & will not eat their food, wet or dry, if I add it. Thanx for this recipe! I’d imagine the same recipe could be used for cats as well. Maybe with the peanut butter mixed in, they won’t fuss at the coconut oil. Fingers crossed! Instead of coconut oil for cats, give them salmon oil. It’ll do the same thing for their skin and coat and also comes in oderless. I don’t use the oderless and give it to my dogs and cats and haven’t noticed any weird oders. Can you post where you purchased the heart mold? Are these small? I have very small Maltese. 4′ and 8′. I actually got the molds at a thrift store but I’m sure there are similar ones on Amazon. And yes, they are small sized hearts. I made these for my dog & he absolutely loves them! And sooooo easy to make! Thank you! I make these for my 14 year old Labrador retriever and hide some of her meds in them. She loooves them and it makes it so much easier to get her to take her medicine twice per day. I also love the health benefits that these treats provide, since our girl is geriatric and has quite a list of health issues. P.s. I purchased our silicone dog treat trays from Amazon and just microwave the ingredients instead of melting on the stove. I otherwise follow the recipe exactly as posted and my dog has never had any issues with the full dosage of coconut oil. One piece of advice: if your silicone trays are flimsy like mine are then make sure you place them on a baking sheet before you start filling the trays. The first time I tried the recipe it was impossible to transfer the silicone trays to the freezer once they were filled with liquid! I make these with brewers yeast for additional benefits. I also let them set up in the refrigerator instead of the freezer and make it in my BlenTech. My dogs love them as a dessert! I picked up a Kong tray at a thrift store for 50 cents as well as silicone ice trays. Dogs love them! I melted coconut oil in micro, added Brewers yeast and table spoon of powdered peanut butter. Pour into mold, put in fridge to harden. Yep, a hit! Also gave a small bit to my cat – he gobbled up with his food. Yay! Gonna try peanut butter, baked yam and cinnamon or turmeric. Great idea to add the brewer’s yeast. There’s a new recipe on our blog for dog biscuits that have brewer’s yeast in them. Check it out! Thank you for sharing your recipe! I am getting ready to make a second batch for my three fur babies – they all love them. I took Marylee’s recommendation and added brewer’s yeast. Even my husband thought they were tasty! Thanks again! Hi there just wondering if you use the coconut oil in a more solid form or melted in oil? I was wondering if you were to microwave it, how long would you put it in there? Just until it’s begun to melt, then stir until completely melted. Hope that helps! Careful with the cinnamon. It’s not recomended to give to dogs. Just fyi.? Great recipe. Make sure to mention the danger of xylitol in some peanut butters. It is toxic to dogs. Thanks! I’ve tried making these treats twice now but I can’t get the treats to harden. They’ve been in the fridge for days and they still have no form. You’re using coconut oil, correct? Because coconut oil has a melting point of 76 degrees, it will harden when put in the fridge. So I’m not sure exactly what’s going on. I always stick mine in the freezer for a while, then store them in the fridge. Maybe try that. Hope you can get it to work! When measuring the coconut oil do you use it in its solid form or melted in liquid form ? I just finish making these and my dogs (4) schnauzer just love them. They are easy, simple, and great ingredients. I don’t like store bought snacks for them. They also like peanut butter cookies that I make with low sodium veg broth, Thanks for a great treat. Thank you for the recipe! I tried it today. My puppy, Lucy, loved them. I added a couple squeezes of honey. So easy and she loved them. Thanks again! 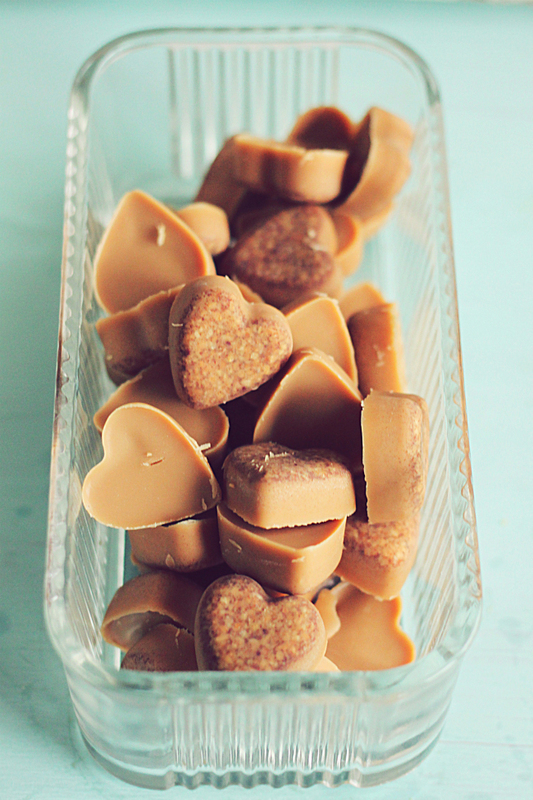 Do you recommend a particular brand or type of peanut butter when making these treats for dogs? Does one type work better (smooth or crunchy) for this recipe? What brand do you recommend? Thanks! I made these super easy, gave them to my dogs and they were unsure at first cause well its something new, once they smelled the peanut butter and tasted it they gobbled it up. One of u asked about what kind of peanut butter I read online that the best kind of peanut butter for dogs is either organic or dry unsaltred peanut butter. What else can I use forflavor?? Can I add like a bit of beef broth or will it not harden like it should?? I’m thinking of adding some honey in there I don’t wanna make it to sweet though. Can I add oatmeal?? Would it also work out if I put like pureed sweet potatoes or instant potatoes or pumpkin stuff like that?? I once heard that PB could be toxic to dogs. What kind of PB do you recommend? Peanut butter is very good for dogs. If it has sweeteners or xylitol it’s toxic for dogs. When I use peanut butter for dog treats I get the all natural peanut butter. Only ingredient is peanuts. It’s like $3 at most grocery stores. How many would you say a 230 pound mastiff puppy could have a day? Coconut oil is 1 tbsp. Per 30 lbs. so a 230 lb dog could have up to 7.5 tbsp. a day. I was trying to figure out the same for my 90 lb. pit. I’m thinking maybe it depends how many treats you got out of the 1 cup coconut oil..? I used 237 grams/75 mold spots so a little over 3 grams coconut oil/treat. Google said 14 grams/tbsp. CHECK my math as I’m just thinking myself…. maybe something like that to figure out ? Is there anything you can add to this that is dog safe that will keep it solid at room temperature? I just realized the peanut butter I used has sugar.. I already gave my dog a treat, do you think he will be alright? I have a 13lb. Skorkie her name is Lucy, and she loves the coconut oil right out of the jar or I might melt some in the microwave for 10 to 15 seconds and pour over her dry dog food. I was excited to see your recipe, and tried it right away!!! Needless to say “Lucy is a huge fan”. I too omitted the cinnamon as I’ve read it’s toxic, and sprinkled some oats in prior to pouring into the molds. There adorable little treats, and Lucy can give them out at holiday’s to her puppy friends. ?? Thanks so much!!! Can you use any coconut oil and peanut butter, or do you have to use a specific brand? Hi- can gelatin be added to these? Would it work? Do I have to melt the PB and Coconut oil together or could I just mix then 2 ingredients? These treats are so easy to make. The only problem is, they start to melt almost immediately…. even after leaving out for 3 minutes. I use organic coconut oil and Organic peanut butter. Am I doing anything wrong? I see treats in dog stores that sit out and they never are greasy or melt to the touch like these. Any suggestions? The melting point for coconut oil is in the 80s. So, room temp can sometimes cause a problem with keeping it solid. I had the same issue with melting just from removing the treats from the mold and it resting in my hand for a split second. Your page won’t let me pin your recipe 🙁 It says that this page does not allow pins. Our site stopped allowing pins sometime over the last week most likely due to an updated plugin conflict. I am working to try and resolve it. Thanks for letting us know and sorry for the inconvenience. Can I use crunchy peanut butter in place of creamy? 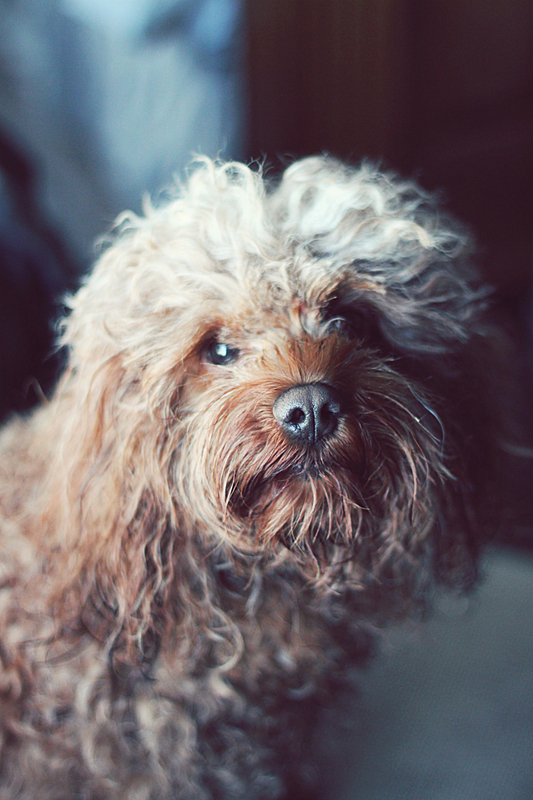 Great idea….just made so looking forward to trying on the boxer n cavoodle. ..we are in transistion of moving away from kibble biscuits n supermarket treats after watching the documentary PET FOOLED….brilliant insight into consumers being fooled by the rubbish in bags…..RAW here we come….. I made my dogs went nuts they loved them thanks for the recipe !!!! I have mine in the freezer. The only problem I had was with the silicone moulds. I didn’t hit me until after I had poured the mix into the moulds– The tray of moulds is so flimsy that the mix spilled out of the shapes when I tried to pick it up to put in the freezer. recipe should add, “place moulds on a cookie sheet”. Other than that, I am looking forward to seeing if my Sydney likes them. Found this dog treat recipe today. Made them and my dog Secret loves them. I cut the recipe in half and still made 24 thin discs. Plenty! Recipe was a snap! I shared the treat photos on my twitter and Instagram and the recipe was requested so I shared online. I hope that’s ok. I may add to my blog in the future if that’s ok also. Thanks for a good healthy treat as an alternative to store bought junk treats filled with preservatives and ingredients I can’t pronounce. Thumbs up! I made these today, My dog dolly loves them! I am allergic to peanuts can I use the peanut free peanut butter? I don’t see why you couldn’t. Its more a matter of preference than anything else. Could I add fresh mint for breath? We have not tried that but you could certainly try. If you do attempt it, let us know how it turned out and how your dog liked it. This recipe sounds awesome! I’m definitely going to give it a try. I do have a question though… we live in GA and I keep my house around 72deg… I know that the coconut will start to melt if warm… do you think I’d be able to get away with storing in the pantry instead of the fridge? They’ll be soft, I’m sure. My suggestion is to keep them chilled in the fridge. Pups like cold treats! Check the dollar stores for holiday themed silicon candy molds! I have several including Halloween, Christmas, Easter, St. Patty’s, Valentine’s (small hearts! ), 4th of July, and even football. Great idea, Tammy! Thanks for the suggestion. Coconut oil has a melting point of 76 degrees, so if it’s a warm day, it’ll be in a liquid state; cold day, solid state. 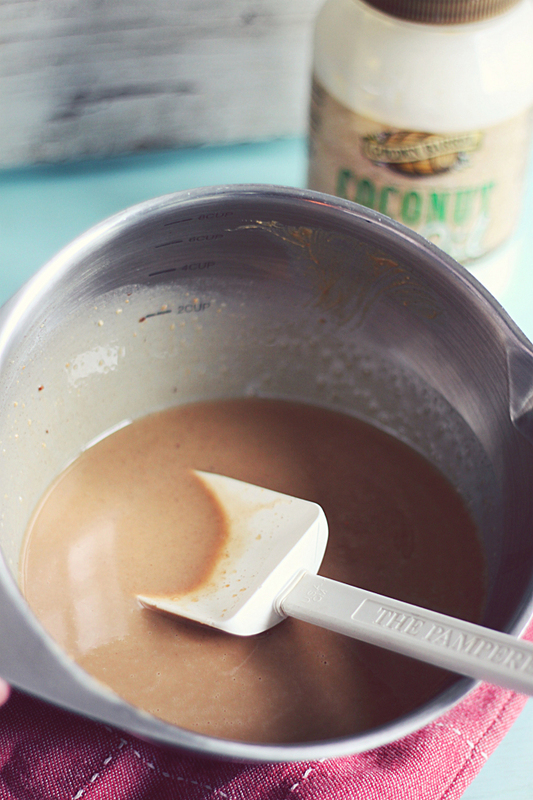 You want to melt the oil and peanut butter and mix it together, adding the cinnamon and mix until smooth. Hope your pup likes them! If you are making it with cinnamon, please use CEYLON cinnamon. 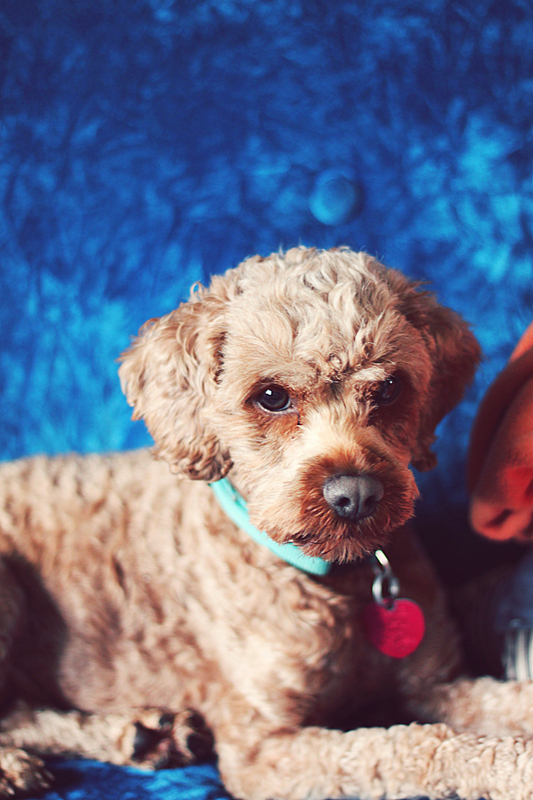 The cinnamon we normally use and usually found in stores is not good for dogs. I would like to make a treat like this but I think my dog is allergic to peanut butter. Is there something I can use as a substitute? 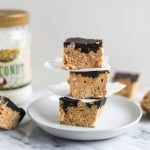 Hi April, unfortunately, the main ingredient in these treats is coconut oil and no other oil would produce the same results of holding the treat together. I realize that the link you shared says to avoid coconut oil for dogs as it may cause some stomach issues. The truth is that coconut oil taken in excess may cause stomach upset, loose stools or diarrhea for anyone (dogs or humans) whose stomach is not used to eating oil of that consistency. Many people have successfully made these treats for their dogs with no issues. If by chance there would be any issues, it should typically clear up as the dog gets used to eating coconut oil. Just Be sure that your peanut butter is natural, unsweetened and, most importantly, contains no xylitol, which is toxic to dogs. I made these for my fur babies & they loved them. I was worried with the coconut oil & peanut butter that it might be to much for their stomachs, but they were fine. I’ll just make sure not to give them more than one a day. what do you have in the bottom of your tray…looks biscuity? or is that pieces of peanut ? Yes, I used crunchy peanut butter and the crunch part settled to the bottom when it set up. the bottoms look biscuity? do you put something else in or is this just the peanuts settling? The recipe sounds very yummy, I love making my baby home made treats. But I’m very concerned about the use of CINNAMON. As there are two types that are typical to buy. One is good for dogs, but the most common one people use in their house is BAD for dogs!!! I thought I should bring that to everyone’s attention. Please do your own research on this if you don’t believe me. We don’t want to make our beloved animals sick because of toxicity. Be very careful what you feed your pets! Do your home work first!! Ive made these twice now. Easiest treat Ive made yet. First time I followed the directions this time I did the same but added mashed bananas. My dog loves them. Im sure you can use honey, other fruit like blueberries or even yogurt. The best way to make them is in the silicone molds. Tip: buy them at Michaels when their seasonal stuff goes on sale or on Amazon. I purchased a set of two molds on Amazon for $9 just last week! Thanks for the recipe!! Please be very careful with cinnamon. There are many types, all of which contain coumarin, a compound that causes liver damage. The most common cinnamon, Cassia cinnamon, has the most, and as little as one teaspoon is enough to make a human very sick. If a dog were to get into your stash of these dog treats and overindulge, it could be fatal. Ceylon cinnamon has the lowest amount of coumarin, and is the only one I’d consider using. Better yet, leave it out. I think the risk exceeds the benefit. These look great! I can’t wait to try it! Thanks for sharing! Do they ever go bad? Coconut oil has a long shelf life, so no, these treats shouldn’t go bad. SUPER QUICK & EASY TO MAKE. My boys are gobbling them up! Hi! Do you know the fat and calorie content is in one treat? I believe there is a limit of coconut oil you can give your dog per day according to their weight. I was giving same amount to my Pit as I was my Chihuahua and she started coughing alot. I read about coconut oil and it tells how much to give dogs per weight and you are suppose to gradually give them this everyday until you get to the right amount. Can I add brewers yeast to this recipe? I’ve heard brewers yeast helps with flea prevention and have heard it is beneficial for dogs. Sure! I’ve given my dog Brewer’s Yeast for the same reason. Give it a try and let us know how it goes! I have two cockapoos! Your dog is adorable! I am going to make these today! i would like to ask if we can eat the cookie also. i definitely like it. have osteoarthritis in my knees, took glucosamine, didn’t work. Hi, although this treat was intended for dogs, they could definitely be eaten by humans as well. I cant say for sure whether or not it will help with your health issues but it does taste pretty good. This looks great for the dog! It would be a fun thing for the kids to make for it! My boys love making these treats! Thanks for sharing! Do they keep long? 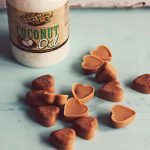 Yes, coconut oil has a very stable shelf life so these treats will keep for a very long time. I store mine in the fridge. I see this is made with refined coconut oil. Can I use unrefined coconut oil? Would these survive shippi g in the mail to people? Do they have to go on the fridge? My husband is a home brewer. Could I add some spent grain? Was wondering if you can use pumpkin instead of peanut butter? These turned out perfect! Thank you so much for sharing!!! Kat – thank you so much for this recipe. My daughter has been making these for our dog for a couple of years based on your recipe. But we recently found another fantastic use for these treats! Our Daisy REFUSES to take any pills. We have tried every single trick we could think of. After total frustration & exhaustion, we decided to empty her antibiotic capsules evenly into each treat before freezing them. Works like a charm! Thank you again so much!! Will these set if I put in the fridge?? I don’t have any room in freezer. Yes, putting them in the fridge will work fine. Coconut Oil solidifies at 76 degrees so if you store them at temperatures less than that, you shouldn’t have any problems. I used coconut oil and all natural organic peanut butter as the recipe said, and put it in the freezer for 3-4 hours, but when I tried it myself, it just melted into a mass of oil and peanut butter. Has nobody tried this recipe themselves? It seems really unhealthy with the amount of coconut oil there is, not to mention really greasy and messy. Keep them in the fridge and they’ll be fine. 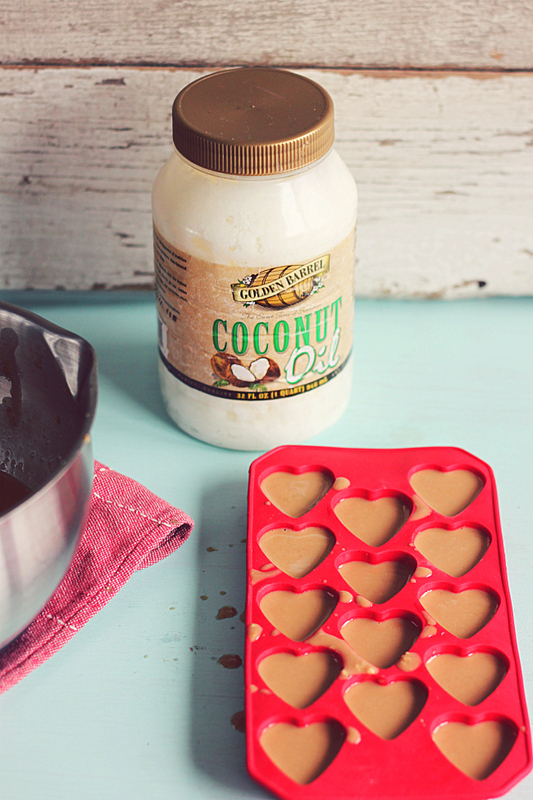 Coconut oil has a melting point of 76 degrees, so if left out in warm weather these treats will be a mess! Just keep them cold and they’ll be solid. Typically it’s recommended that dogs don’t consume chocolate, so I would be careful and avoid adding it to these treats. How long do these typically take to freeaze? Only a few minutes for them to harden. Can I use any coconut oil or does it have to be Golden Barrel? When giving my pup coconut oil does it have to be doggie coconut oil or can it be the one I use? 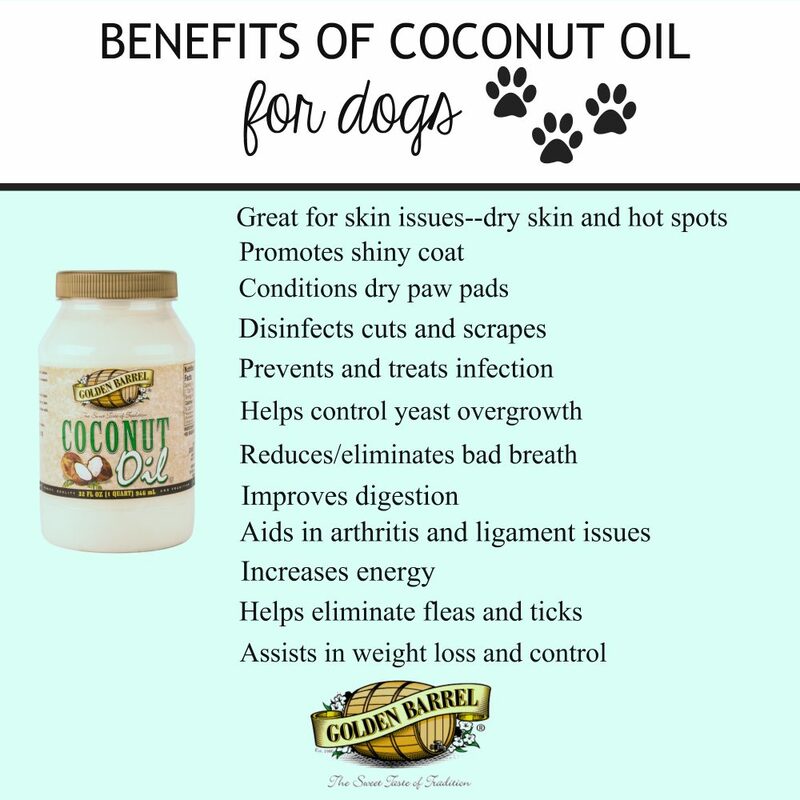 Never heard of doggie coconut oil before! Yes, typical coconut oil is what you would use. Are they soft Kat? We have a 13 year old boxer that has to have soft treats and his daily foof. P.S I tried a little bit of it and its not too shabby. I have 2 diabetic dogs…is this a safe treat for them? Just tried this tonight. It’s quick to put together and used silicone molds so they were easy to pop out. My German Shepard loves them. Thanks for the recipe. Will certainly make this often. © 2019 Golden Barrel is a brand name of Good Food Inc.